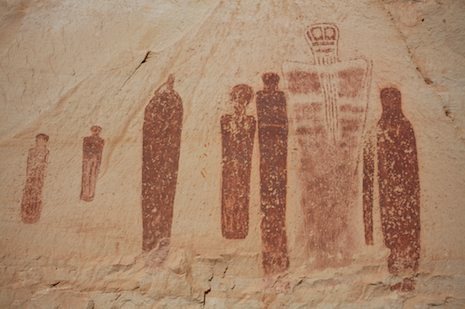 Ancient nomads created the larger-than-life image perhaps as long as 7,000 years ago in the deep recesses of the Utah canyons, perhaps as a response to a dying way of life. 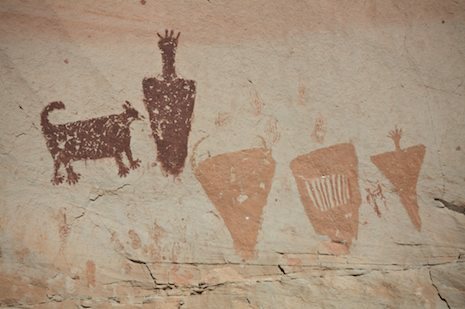 They form a body of rock art unsurpassed in the Southwest. Today I’m working my way east on Interstate 70 towards Moab. The sun is out but there is a misty gray sky on the horizon. It’s cool. The Weather Channel reports are not promising. I’ve got a storm behind me and it’s gaining. But for now it’s holding up well enough for an hour or two of exploring here and there. Just east of the turn off to Moab is the small town of Thompson Springs, another of the small railroad stopping spots that have gone to seed. The town is small and definitely on the decline. None of the few stores are open and cars and other equipment sit rusting in open fields. But I’ve not come to explore the town. The road that leads through it heads north up into the mountains, and not too far up are a series of sandstone cliffs that hold panels of what is known as Barrier Canyon Style rock art. It’s an easy place to find. There’s a turnout right by the side of the road and the pictographs stand out in stark contrast to the surrounding brush. 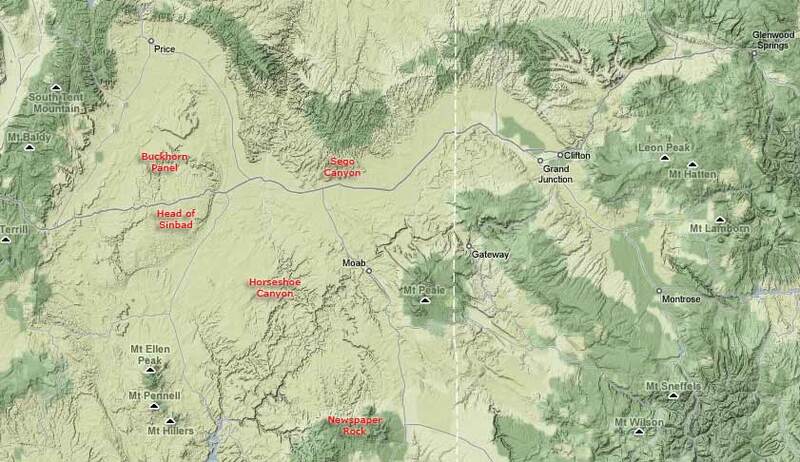 This part of the Colorado Plateau is an area I’ve come to know well. In the late 1980s after a river trip down the Colorado through Cataract Canyon I drove back through Capitol Reef National Park and spent the night in the small town of Torrey. The next morning I ate breakfast at what would become a favorite restaurant of mine, the Capitol Reef Inn. Near my table was a real estate brochure with properties offered for sale nearby. The prices were amazing – 30 acres or more for less than $30,000! I vowed to come back soon and see if I could find the right property for me. I was back that Thanksgiving, got lucky and before I knew it I’d bought a 26 acre tract in the middle of the valley for $26,400. The following summer I began building. I’ve sold the house since then but kept 16 acres, which I still visit now and then. What captivated me most was the bedrock. The property was located on a ridge that was mostly all rock with just enough soil to host a scattering of pine and juniper. However, as I traveled thought the area what eventually impressed me even more was the rock art. Though hidden, as I explored more I was amazed how much there was. Traveling through the Capitol Reef area yesterday has brought back vivid memories of the art and the connection I’ve found with it. Looking at the map it is easy to see why the area is so rich with prehistoric rock art. In the valleys of the Fremont, San Rafael and Green River valleys, with plentiful rainfall and a warmer climate, the scattered bands of hunters and farmers must have found this a reasonably good place to live. Occupying the area from perhaps as early as 7,000 years ago to as recently as 3,000 to 1,500 years ago – quite a span considering the comparatively short length of our own civilization. 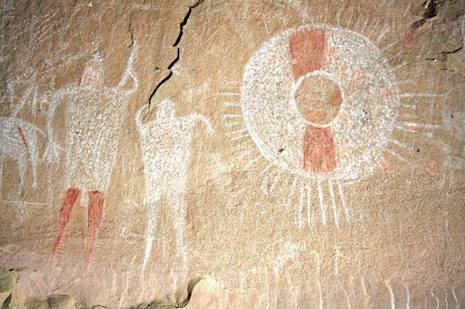 Archaeologists thought initially there might perhaps 160 rock art sites such as this but in the past decade or so more than 275 sites have been identified and some believe there may be as many as 400 of them. 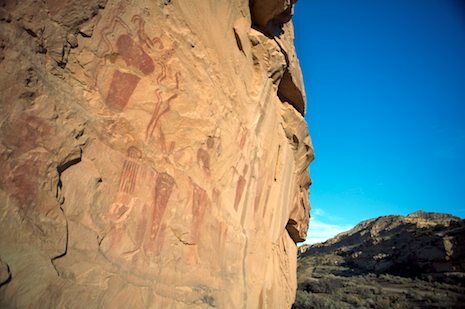 Scrambling up to get a better view of the main panels at Sego Canyon, I’m surprised to find that the bold red figurines that dominate them hide other paintings below them. There are dozens of these figures, most of them 3-4 feet tall with broad shoulders, small arms if any at all, haunting eyes or faces which hold their own detailed designs. More recent Sego Canyon rock art differs quite a bit from the Barrier Canyon Style. It is difficult to understand the meaning. Nearby is another panel that contains paintings of a much more recent time. The Barrier style art may date back as many as 4,000 years, well before Christ, the advent of Western civilization or the rise of modern European culture that fostered the explorers that eventually discovered places such as this. The mind set would have been incredibly limited. While the farming techniques they practiced in the Green River valley had their roots in places far to the south, undoubtedly their world could not have taken them much further than Moab to the east or the Canyonlands area to the south, an hour’s drive for me but a lifetime trip for them. These were first Americans -ones who disappeared a thousand years or more before the first European stepped ashore. Nearby are a host of other sites, Horseshoe Canyon, Buckhorn, the Head of Sinbad as well as dozens of sites that remain unnamed. At one known simply as the “Great Gallery”, a panel that is more than 300 feet in length, home to more than 80 figures, most of them six feet or more in height. 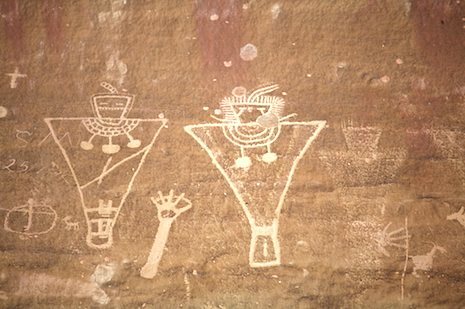 Tucked deep in the elbow of a 500 foot tall canyon wall, they are far from the village sites where the artists must have come. It may simply be that in a world of tremendous forces over which they had little control, they would seek out places that had mystical powers for them in attempt to exert some influence of their own.